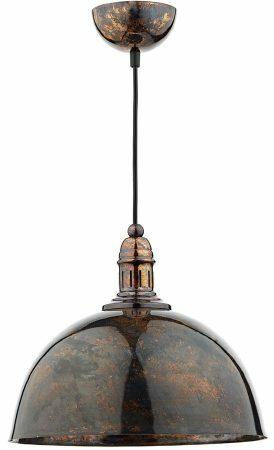 The Dar Yoko industrial style kitchen mottled bronze pendant light, a retro styled ceiling pendant. Gloss lacquered domed mottled bronze shade, matching ceiling mount and vintage style black braided suspension flex. A great choice for the dining room or modern kitchen, fitted with a generous amount of suspension flex allowing it be mounted at a lower level or from a higher level ceiling. Height adjustable at the time of installation, minimum height 36cm, maximum drop 136cm. Other products in the Yoko industrial style lighting range can be viewed below and include a polished copper pendant light.